Along this beach walk you'll get so see some fascinating sea life and also some of the highest fossil dune is South Africa. If you have taken the turn-off at Sedgefield-links just to the west of Sedgefield and you are driving alongside Swartvlei (Sedgefield Lagoon), you are heading for Gericke's Point beach. Park in the designated area - there are toilets here - and head to the right along this beautiful stretch of beach, which at certain times of the year is strewn with shells. Essential items are your camera, a hat and water because you're going to spend some time here. Ascertain yourself of tide times. The best time to go is when the tide starts going out. 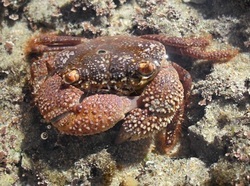 The rock pools give you a glimpse of fascinating creatures like sea crabs, shells, anemone, colourful small fish and sea urchins which can only be seen at low tide. Another reason for going at low tide is that Gericke's Point becomes an Island at high tide. Don't get so engrossed with looking at the rock formations, fossilized sand dunes and sea birds that you forget to check on the rising tide, unless of course you really want to spend a very long time at the Point! 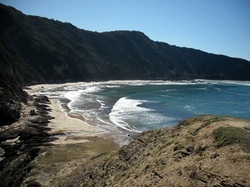 Sedgefield itself is bordered by a series of parallel fossil sand dunes which are the highest in South Africa. 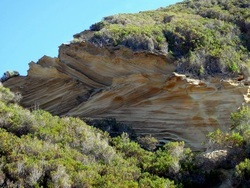 The start of this series is to the west of Sedgefield near Kaaimans River and these sand dunes extend all the way to the east of Sedgefield at Brenton on Sea. Beneath the sea the ridges extend south, forming a series of reefs renowned for their sea life. 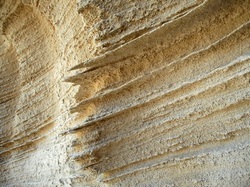 Over a period of time steep cliffs have formed and if examined closely you will notice distinct layers and patterns in the dunes which were formed by water, wind and sand erosion. The ruins along the way are those of the old whaling station which luckily closed down some years ago. 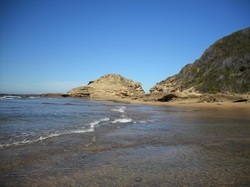 From the parking area one can also walk along the beach towards Sedgefield if you would like to spend more time here. Distance: About 4km to the point and back. Other: There are toilets at the start. Take enough water for the walk.